GUYS!!! AHHHH! Is this even real life?! I have dreamed about this moment for so long & it is finally here! I cannot wait to spend forever with the love of my life!! I thought I would do a little blog post over the matter because uhhh… this is a huge life altering moment!! And I just love being able to share bits of my journey with you guys too! I have never felt so much love from so many people in my life! Thank you all for the kind words on my post and all the sweet DMs & text messages! I cannot wait for all of you to follow along our journey as an engaged couple and eventually as husband & wife! Not many people have the opportunity to share their life milestones with thousands of people and for that I am so so grateful! YOU GUYS ARE AMAZING! NOW, on to the exciting stuff. First, I thought I would explain how the whole proposal went down. Grant is one clever guy for sure. 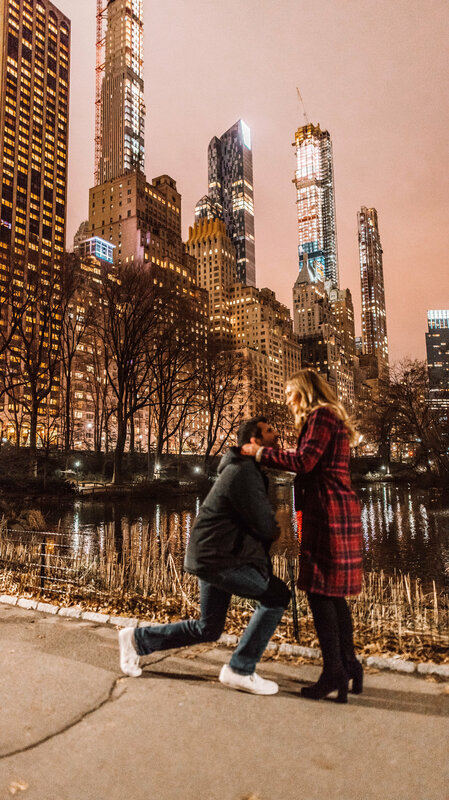 This Proposal was magical! And it is a pretty cute & funny story too. So for those of you that stay up to date on my tripod nonsense, you would know that I take a lot of my photos myself on a tripod. 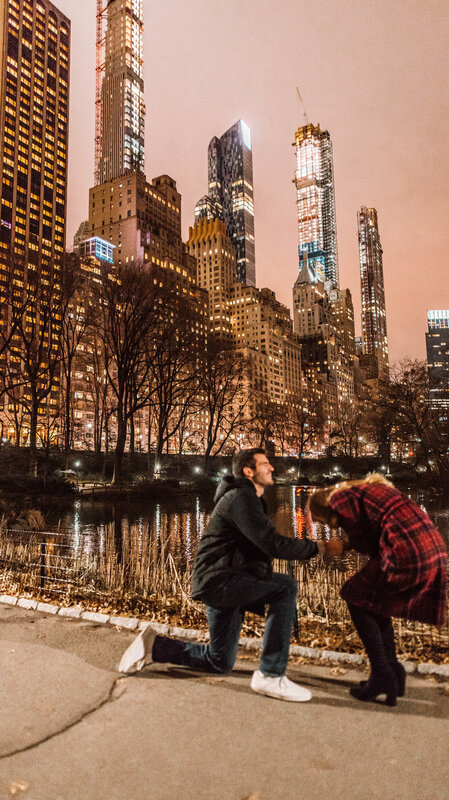 So... Grant said we should do a night time photoshoot in Central Park and of course I said yes.We take all of our photos together on a tripod so this was nothing out of the ordinary. So we walked down this path in Central Park and found this perfect city back drop. I then set up the tripod and as it was taking pics, he got down on one knee and proposed!!! Turns out the best secret photographer for my engagement was ME lol! The whole thing was such a blur! I was just so freaking excited to be engaged to him! I was definitely surprised, but I knew we would be getting engaged soon. Grant and I have had an ideal wedding date set ever since we were Juniors in high school haha! Call us crazy but I knew it was only a matter of time. Also, for those of you who are newer around here, Grant is 20 and I will be 20 in a few months! I know we are both young but when you know you know. We have been together for nearly 5 and a half years, I am MORE than ready to make things official forever! Plus we just aren’t conventional people lol. Never have, never will be. I have a full time job making a living on social media & Grant will be done with school in 2 years. For me, that is perfect. I am a huge advocate for finding your own path and not conforming to the mold society sets for us. I am happier doing things my own way, and getting married young will be the BEST adventure. Here are some shots that the tripod captured! Whenever I take photos on my tripod I set it to take 20-30 pics in a row! We started out just doing a normal kissing pose like I thought and then Grant got on one knee and voila! This ring is literally my DREAM ring. Grant actually custom made the design & it was made with antique diamonds! It is a custom mix of rose gold and yellow gold so that it wasn’t too pink but wasn’t yellow either. It is a beautiful light rose gold coppery color and I am OBSESSED! The center diamond is a Marquise cut with 8 other diamonds surrounding it. It is so vintage looking, unique, and of course stunning. I can’t get over it! I have been thinking about this a lot the past few days haha! First off, it is just crazy saying I have a FIANCÈ. That is going to take some getting use to. Second of all, THERE IS SO MUCH TO PLAN FOR! I mentioned earlier that we had an ideal set date for the wedding, but now that it is here I have no idea! I also thought I had an idea of what my wedding would look like ( @ my pinterest board with 20k + wedding pins lol). But now I just feel like there are so many possibilities I am not sure! ALSO where will we live? What will our life be like? What do we WANT it to be like? AHH just so many excited things to think about! Needless to say these next few months will be super exciting and lots will be answered! For now, I am just going to stick to celebrating my engagement with Grant! We will be doing an Instagram live soon and will be talking more about our engagement and answering any questions you guys have about it all and our relationship! Stay tuned on my insta stories for when we will be doing that! Thank you all so much for your love and support! It means so much!